Isn't that bunny just the cute-est little thing?? As always in MDS, I chose all my colors. I then added the mats around our little bunny in Easter-y colors. And printed it out on card stock on my printer. You get truer Stampin' Up! colors by having it printed through Stampin' Up! 's print service. But, I needed instant gratification. I don't plan well enough that I could wait for them to be printed and sent to me. Anyway, I completed this hybrid card by cutting out the bunny image using one of the Framelits from the Window Frames Collection. I added that atop the largest Framelit from the Apothecary Accents. 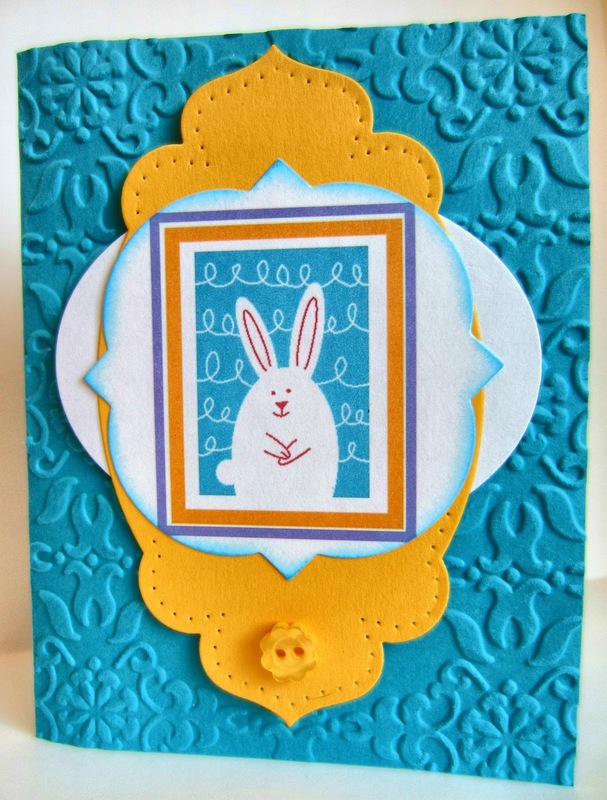 Even after I embossed the Tempting Turquoise card front with the Vintage Wallpaper Embossing Folder, it just seemed like it needed something more. That something more came from the wonderful Ovals Collection Framelits in the form of a plain white oval set horizontally. Perfect. I added some paper piercing around the edges of the yellow Framelit using the Essentials Paper-Piercing Pack and a cute little yellow flower button. Linda this is a beautiful card! Your cards blow mine out of the water! I posted on my blog looking for a guest blogger who is competent in stamping (unlike me). If you are interested let me know. It's a great card. I love the bunny and how you used all the dies for that great background. Happy Easter! I love all of your linkups this week. I am wondering if my mum would enjoy an online Stampin Up course as a present. I'll have to look into that. Happy Easter....linking up from the Meet & Greet blog hop. I love your sight and will follow you here or pinterest or Etsy. What a sweet little bunny! Thanks for sharing this on The HomeAcre Hop! See you Thursday on the next hop! cute card! I need hosting for my page.A friend of mine recommended me www.elcoplanet.com have you ever heard about them. i have checked there web site and it seems that they offer chip prices and good performances unlimited web hosting space and unlimited bandwidth. What a cute bunny and card! Cute card! I love that shade of blue! Cute little bunny! Thanks for sharing @ Submarine Sunday! The blue and yellow are so pretty together and look like Spring. Thanks for linking up. Well he just hops right out of that card with all those lucious layers!! How cute!! The colors are great too..very happy and bright!